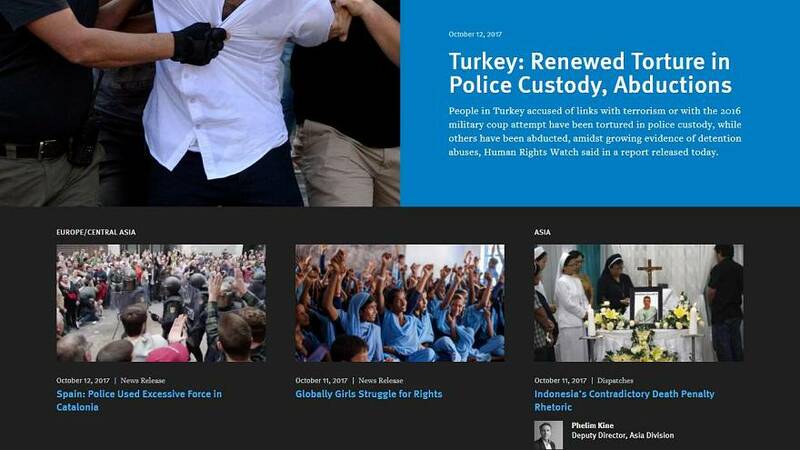 Human Rights Watch (HRW) says it has documented several cases of torture and enforced disappearances during the past year in Turkey. In a report published on Wednesday, it provides evidence of at least 11 cases of serious abuses in police detention in which detainees were beaten, stripped and threatened. “The evidence indicates that torture in police custody has returned to Turkey. The government urgently needs to investigate and order it to stop,” Hugh Williamson, director of HRW in Europe and Central Asia, said in a statement. HRW also documented five cases of kidnapping in the capital, Ankara, and in the south-eastern province of Izmir between March and June 2017, which could be forced disappearances. Last August, HRW sent a letter to the Turkish Justice Minister, Abdülhamit Gül, demanding an investigation into the disappearances, but without reply. HRW said the greatest risk of torture occurred when an individual was held over alleged links to US based Muslim cleric Fetullah Gulen or the PKK Kurdish insurgent group. The government accuse Gulen of masterminding a failed military coup attempt in 2016 and since then has conducted a massive purge of people it suspects of supporting the cleric from all organs of the state. More than 50,000 people have been arrested, including more than 170 journalists and many opposition politicians, academics and activists.